Download this article as a printable pdf file. What makes a home environmentally admirable? Here are a few ideas to get started. 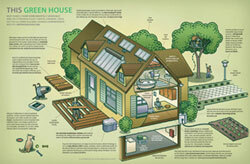 For more, check out the U.S. Green Building Council's comprehensive Web site, greenhomeguide.org. Even if it's certified by the Forest Stewardship Council, tropical wood from Asia must be shipped halfway across the globe. The emissions due to transport from a local sustainably managed forest are sure to be less. Visit sustainableforestprods.org. For the Sierra Club's take on forest certification, go to sierraclub.org/committees/forestcertification. If you live where temperatures are simply too extreme to get by without technology, invest in a high-efficiency HVAC (heating, ventilation, and air-conditioning) system. For the ultimate efficiency and lowest initial and operating costs, design your system after you've squeezed everything you can from passive energy-savings techniques. For more information, go to tinyurl.com/6jf6cr. Traditional photovoltaic systems are installed at a fixed angle, facing south, and provide about 12 percent efficiency. An active tracking PV system rotates to follow the sun throughout the day and year, increasing the system's efficiency by 30 to 40 percent. To learn more, visit tinyurl.com/57vngb. Incandescent bulbs are one of a household's largest energy consumers. LED lightbulbs are up to 30 times more efficient than incandescents, contain no mercury (unlike compact fluorescent bulbs), and last for 30,000 hours instead of 1,000. For more information, go to tinyurl.com/6fxkf5. Eat your organic granola on a recycled kitchen countertop. Terrazzo combines the ecofriendliness of 95 percent recycled content (glass, stone, and other materials) with the durability and scratch resistance of cement. Or consider countertops made of 50 percent bamboo and 50 percent recycled fiber from construction sites. Find examples at terrazzonetwork.com and kliptech.com/ecotop.html. Illustration by Peter and Maria Hoey; used with permission.